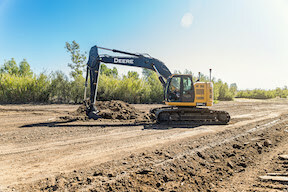 Topcon X-53x automatic excavation system uses a new calibration method that communicates wirelessly via a total control station, rather than requiring an operator to type in values manually. The system uses the same components of the original system and adds hydraulic, automated control. The system controls the depth of the excavation as well as the angle of the bucket.